Admission to the Kaiyukan! 1-day Unlimited Rides Pass on all Keihan train lines, the City Subway, New Tram and city bus all lines! Valuable ticket that you can enjoy Osaka completely! Free admission to 28 facilities in famous tourist areas. The best ticket for enjoying the attraction of Mt. Hiei to the fullest! The ticket gives you unlimited rides for a day on trains, buses, cable cars and ropeways crossing Mt. Hiei, as well as the mountaintop shuttle buses. The best ticket for a casual visit to Mt. Hiei with many must-see sights! The ticket gives you unlimited rides for a day on trains, cable cars and ropeways from the Keihan Line to Mt. Hiei, as well as the mountaintop shuttle buses! Get this ticket to make full tour around famous historic spots near Biwa Lake and Ootsu. Going around two touristic areas: Kyoto and the Lake Biwa / Otsu. The ticket gives you unlimited rides for a day on the Keihan Railway Otsu Line (Keishin and Ishiyama-sakamoto Lines) and Kyoto City Subway (Karasuma and Tozai Lines). 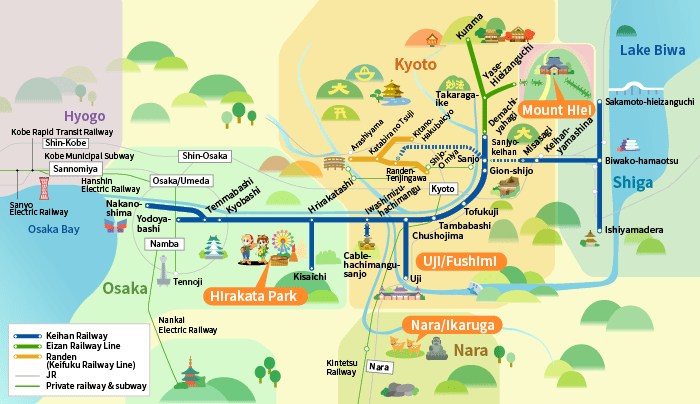 1 Day Unlimited Pass around Nara!